I have been just a wee bit distracted lately. I started a few slow-growing perennial seeds back in February and the poor things are so neglected that I'm not sure they're even worth keeping (but of course, I will anyway!) So my daughter K made me this sign and hung it on my chair so that I will see it each day and remember not only to check on my poor little seedlings but also to plant more. Thanks K!! The reason I'm so distracted is that I work at Mount Royal University and my program is going to get cut. I could be out of a job in a year. This may not seem like a big deal to most people but if you work in academia, the jobs are typically few and far between, and finding a new one almost always means moving. I won't rant about it here except to say that the provincial government is seriously hurting post-secondary education - both quality and access. Do you have teenagers finishing high school in the next few years? You should be worried. Have you written your letters to your MLAs? You can also browse through old posts under the category "seeds". This weather has been great for getting outside! What with the warm weather, and the new space opened up in my front yard, I can't help starting to think about gardening! Believe it or not, there is plenty you can do in February in Calgary. How to make a large, new perennial garden on a budget. Garden planning: front yard garden design. My favourite plants for a sunny, low-maintenance front yard garden. I've almost finished my seed shopping but it's not too late to start if you haven't yet! Stifle the urge to start seeds too early. Look at the package for recommendations regarding how long before the last frost date (May 23, for us Calgarians) to start seeds and calculate backwards. Organize seeds packs according to planting date. I am trying a few slower-growing plants this year so will be starting iceland poppy 'solar fire', salvia 'marble arch', and bunny tail (lagurus) indoors sometime this month. See this post on how to winter sow for an alternative, zero-energy, low-maintenance way to start seeds. with the days getting longer, house plants are starting to wake up now. I'll gradually increase watering and start light fertilizing of houseplants next month. Right now is prime pruning time for most deciduous trees and shrubs (but not spring-blooming shrubs such as lilacs!) I plan to get outside this week-end to do a little pruning of overgrown branches here and there. Since I keep my shrubs in a natural form, pruning mostly involves cutting back a few older or overgrown branches at ground level and doing some minor re-shaping each year. See this post on thinning and rejuvenating shrubs. I started seeds of calendula, nigella, kale, zinnia, kohlrabi, tomatoes and sweet peas indoors a while back, and I'll be transplanting them out into the garden this week-end. I also picked up some starter plants of snapdragons and marigolds that I'll be transplanting out too. And finally, I have more seeds of nasturtiums, scarlet runner beans, corn (a dwarf variety I thought I'd try just for fun, I'm not expecting much), lettuce and spinach to sow this week-end too! the time to plant veggie seeds outdoors is almost here! Feeling slightly panicked, I just turned in 180L of vermiculite into my raised veggie beds on Monday, and then ordered some good quality "garden mix" from Western Canada Compost to top them up with this week-end so they are ready to plant. I really should have done this last fall. I hope to be planting beets, carrots, kale, lettuce, peas, spinach and chard outdoors next week. How 'bout you? What you need to know about building raised bed vegetable gardens - this post includes the basics of how and why, plus some links at the end to some very inspiring designs. My seed-starting setup - This post describes what I do to start seeds, and the how and why of it all. But if you're new to vegetable gardening, don't be intimidated! Check the when-to-start link above and remember that anything that can be direct-seeded outside does not have to be started early (inside) with any kind of extra equipment! Direct-seeding outside is probably the easiest option in terms of work as long as you don't overseed (you'll have to thin later) and as long as you keep those seeds moist until they germinate. Cold frame inspiration - I don't have cold frames (yet...) but they're great for extending the season if you're really serious about maximizing your production. They could be as simple as a movable wooden frame with some plastic resting on top that you can put away when not needed, or they could be a permanent structure like some of the ones shown in this post. Most of the posts above also have links to other posts - my own and others' as well. So do a little research, a little planning, and be creative and have fun with your vegetable garden this year! my seed-starting setup: it ain't pretty but it works! Everybody's talking about starting seeds these days, it seems! Paula asked me in a comment on a previous post about my setup, and then last night on the phone a friend told me she'd gone to a seed-starting workshop but felt overhwelmed because she could never be "that organized". It's not very hard, really! (Do I look organized? See picture below!) But there are a few things you need to know for best chance of success. Above: My home-made seed-starting shelf just happens to fit into a corner of the furnace room in the basement. Sometimes it's hard to get to because so much junk gets shoved in here... but I've currently cleared a trail. Notice the bag of milk cartons "saved for a craft". Anyway, I only have one light on at the moment since there are only a few seeds that I start this early (see below.) The seedling trays are sitting on boxes and egg cartons to raise them up as close to the lights as possible. Very high tech. This is one of the most important things to get right. If you start seeds inside too early, they will get leggy (stretched) as they try to grow too high reaching for more light. So first, check your seed package and it will say the number of weeks before planting outside to start the seeds. If they are annuals, you don't want to plant them outside until around the last frost date, which is about May 23. Frost-hardy perennials could be planted out several weeks earlier. Make yourself a seed-starting timetable to keep yourself on target. Keep in mind that lots of things can be direct-seeded into the ground in May - so don't make more work for yourself if you don't have to! I start all my lettuce, spinach, chard, peas, beans, carrots, beets and more by planting seeds directly outside. There are plenty of resources on the web and I've posted links to several before (also see the bottom of this post.) You don't need fancy stuff - you can use almost anything as a container as long as it drains. Basically, a heat mat (or warm place to germinate such as over the fridge) is necessary for some seeds like tomatoes (if the seed packet says germination at 20oC or higher, you will want a heat mat. For other seeds, it's just a nice-to-have and will start your seeds a little faster.) If you are starting anything other than fast-growing annuals just a few weeks before planting out, then you will want lights as well. Keep the lights on a timer set for 16 hours on per day, and keep the lights as close as possible to the tops of the seedlings. Above: I discussed leggy seedlings in more detail in April 2009 when I noticed that a certain someone's lavatera seedlings (name withheld for protection!) just weren't doing quite as well as mine because they were growing in a windowsill instead of under lights. So your seedlings have light and you're watering and fertilizing them regularly. Duh. What else do you need to do? Thin them by transplanting and/or cutting out some seedlings that are growing too close together (I use nail scissors.) Blow on them or turn a fan on them for a little while each day. Seriously! This strengthens the stems. Things like tomatoes benefit from being replanted a little deeper in larger pots several times during the seedling stage. Transplant anything that is getting too large for whatever container it's in. Above: In March 2008 I already had to transplant my tomatoes into larger pots. Above: By mid-April 2008, they were too tall for my seed-starting shelf so I had to move them to a south-facing window. Obviously, they were not ready for planting outside at that time of year! Now I don't start tomatoes until late March. Gardening is all about learning from your experiences! This is the last step before planting seeds outside. Basically, you want to get your soft, indoor-grown seedlings ready for the conditions outside - wind, stronger light, etc. You have to do this slowly and it is essential! Put them outside in a shady, sheltered spot for a few minutes each day, gradually working up over several days from about 30 minutes to a full day. And of course, if you are planting them out in May sometime, there is always the risk of frost or snow after you have planted your tender babies outside. Be ready to whisk pots into the garage or cover plants with sheets to protect them. More on this in May! If you have other questions about starting seeds, post a comment here and I'll try to answer them. Blogs and Blooms Video: How to start seeds the message - it's easy! Blogs and Blooms Video: Transplanting your seedlings, including hardening them off - a critical step. Seed-shopping season is long done for me - I like to order seeds in January. Why? Because it makes me feel like I'm gardening in January. And the selection from catalogues is much greater than what you can find in a store. And it is easier to cross-reference the catalogues with your notes, articles you've saved, and the internet if you're in the comfort of your own home rather than a store. I also randomly ordered seeds from Floribunda Seeds last year because they were the only place I could find who had teasel seeds, and received good quality seeds. I've also heard of people who've found Park Seeds from North Carolina to be very reliable, but they're American. If you're in Calgary, I would recommend attending Seedy Saturday in March. At this time of year it is probably just fine to go to any old store and pick up some seeds. Of course, the garden centres will generally be better staffed to answer your questions, but the "big box" stores are probably OK too if you know what you want. I am starting to work on that presentation I mentioned a few weeks ago. What do you think? nicotiana sylvestris, annual - the last of the seeds from 2008, I don't really have space for this large plant this year, but I'll squeeze a few in because I got so many compliments on them last year, plus they smell awesome. verbena bonariensis, annual - this self-seeds around my garden but I always start a few extra to be sure. I grow it in the butterfly potager and the adventure garden. The last of the seeds bought in 2008. I should really get around to collecting my own from now on. cleome, annual - this package of seeds was purchased in 2008 and if they germinate well this year, I'll keep them for one more year because I still have tonnes. salvia marble arch, annual - another self-seeder but I always start some as well. I like to plant this in my front entry garden and always get lots of compliments on it. Used the last of the purchased seeds from 2008.
castor bean 'impala', annual - the last 2 seeds from 2008. I usually grow this in a pot because I don't have a hot enough spot in the garden for its liking. lychnis (rose campion) - I have a few of these in my front welcome garden but I'd like to have a nice big patch so I'm starting some seeds that I purchased this year. amaranthus (love lies bleeding), annual - I got some seeds from a seed exchange so... why not? sidalcea (prairie or checker mallow), perennial - Also seeds from a seed exchange, but this is a perennial I don't have and would look great in my front entry garden. I have no idea what colour the flowers will be! The seeds I started 2 weeks ago are all up and doing well - except the potentilla, of which only one germinated. Those seeds were also from an exchange and were labelled 2006, so I didn't have huge expectations for them anyway. As soon as there's room on my heat mat (probably about a week or so) I'll be starting some tomatoes - yee ha! It feels like spring! To see some of the annuals I started from seed last year, check here. I notice I was complaining last August that I planted too many big annuals and should plant less in the future... yeah, that was the wisdom of mid-summer talking. Currently I'm in the middle of spring deprivation and my spring self is not listening to my summer-self... the more seeds the better! I can always give some plants away if necessary. As I mentioned previously, I'm supposed to make a presentation in a couple of weeks about edible gardening in Calgary. While there are some specific things people need to know that are very unique to Calgary, the basics of starting a vegetable garden don't change, and the Renegade Gardener just posted an excellent article. Do you read the Renegade Gardener? I can't remember when I first discovered him, but I've been reading him for years. He knows his stuff and he tells it like it is! Everyone's talking about spring. It was gorgeous in Calgary this past week-end! Well, gorgeous weather-wise, not gorgeous garden-wise. Personally I'd rather have snow than the brown dirty mess we have right now. potentilla 'Miss Wilmott': why? see above. For a straightforward article about starting seeds, click here. Since I've had some questions about it, here is the macleaya cordata (plume poppy) I started from seed this spring. I ordered the seeds from Florabunda Seeds. As it says on the follow-up comments on this post, I've since heard that this plant is fairly difficult to start from seed. I managed to get one little seedling out of a whole packet! Anyway, that's all I needed. This seedling spent the summer in a pot until it was big enough (now) to be transplanted into the back of the adventure hill garden in my Calgary backyard. It is in front of a big spruce tree so won't get the moisture it loves, but it is a tough plant and I hope it will do all right here. Generally I don't start too many perennials from seed (only annuals) because perennials take longer to get to a decent size. But this plant grew quickly and if you look closely you can see it even has a flower bud on it, which not many perennials produce in their first year from seed. But those big, deeply lobed leaves with white undersides are the reason I wanted this plant in my garden. Wow. Did my camera actually take these pictures? This euphorbia is pretty, although the variegation did not appear until just a week or two ago so it didn't look very exciting until then. And it is rather spindly so if I grow it again next year I must remember to plant them much closer together. Snapdragons - love them! This year I grew the 'Ribbon Series' which gets about 18 inches tall - not quite tall enough to need staking which means less maintenance for me (because really, I never would get around to staking them until it was too late). I love them especially because they are very frost tolerant so can go in the garden early and they bloom much later than many other plants for an extra long season of colour. My kids also like to pick the flowers and make the dragons "snap". Sweet peas, another must-have! Actually I tried morning glories as well this year (another annual vine) but they barely even started to grow until recently and there is still no sign of flowers - hence no photo. After planting them, I found a reference that said they really like heat and therefore they probably aren't the best annual vine for Calgary. I'm going to give morning glories a pass next year and just plant more sweet peas. Right now I'm cutting bouquets of sweet peas every few days and the smell is heavenly! I also have a sweet spot for them because they were in my wedding bouquet! Painted sage (also called clary sage) self-seeds a little bit around my garden but I always start some from seed to make sure I have more. I always get questions "what is that plant?" so I know it's a keeper! The bracts turn pink, purple or white and look very unusual. This pink one happened to pop up in the new side of the front garden, probably because a seed found its way into my compost bin. That's bearded iris in the front and catmint 'Walker's Low' and sedum 'Autumn Joy' in the back. Cosmos - I also love these and start some every year. So easy to grow and the more you cut 'em, the more blooms you get! Great for bouquets. Nicotiana sylvestris has been easy to grow for me and gets up to 6 ft tall in my garden! Every year after I plant it, it takes a while to start growing and I think I'm not going to bother growing it again. But then it starts flowering and the scent overwhelms me! So sweet! The big leaves sure grab your attention as well. I don't really have space but maybe I should make some? The lavatera 'Silver Cup' is a must-have. It is getting huge and bush-like but I just keep cutting it back and making bouquets with it. Love it, love it, love it! The verbena bonariensis can be seen here in front of purple monkshood, pink lavatera, purple liatris and white echinacea. This is called a "see-through plant" because it is so wiry that even though it is tall, you can plant it in front of shorter things and can see through to the things behind. It self-seeds a little bit but I always start some from seed to make sure I have lots in the garden. It's also a butterfly magnet. I already mentioned that my castor bean isn't as big as usual this year, but I think that is due to location. I also start this from seed every year. I never really know where I'm going to put it but I jam it in there anyway. And I'm supposed to be a garden designer? Here's a cloud of borage in the bottom right of this photo. There are several such "clouds" in my garden. This plant mysteriously appeared in my garden one year, and once you have borage you will have it forever. I do love it though (and so do the bees!) and it is easy to pull up and remove any plants you don't want. This year I started resorting to giving some away. And finally, there's cardoon, which I wrote about here. Here's the cardoon growing at the back of my garden. I started it from seed this spring on a whim, because I'd read lots of recent articles about it being such an "architectural" plant for the ornamental vegetable garden. I planted it cause I thought the kids would like it - the leaves are huge and the interesting flowers look like artichokes. But as I was cutting it back last week-end (because of course, I planted three much too close together), I decided I may as well try to eat some! I should have known when I started googling "how to cook cardoon", that I shouldn't have bothered. As far as I can tell, you're either supposed to blanche the stems before harvesting, or peel and boil the heck out of it with lots of salt and lemon to remove the bitter taste, then serve with a heavy cheese sauce. Hmmm... So I boiled the heck out of it with lots of salt and lemon, but after a quick taste test decided not to waste the cheese sauce! Anyway, it was an interesting experiment. I still like the look of this plant and I'll probably grow only one next year, instead of three, if I can find space for it. these are my repotted tomatoes, and what they are too! Just finished repotting my tomato seedlings this morning. The dishes never got put away last night, but really, what's more important...? I won't spend too much time on tips since I posted a lot on repotting and taking care of tomato seedlings last year. Lots of information on growing tomatoes from seed can also be found here. · If you covered your seedlings to keep them moist after planting, uncover them as soon as they have germinated. An environment that is too moist may cause damping off, where the seedlings basically rot at their base, fall over and die. · Thin the seedlings so that there is space between each individual one. Seedlings that grow too close together will depend on each other for support, and end up with weak stems. · Turn an electric fan on your seedlings for at least a couple hours per day. Some air movement will also help to strengthen the stems and prevent mold and mildew from forming. 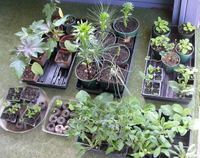 After being away for the long week-end, I was happy to come home and see that all my seedlings survived my absence. Four days was pushing it though- a few had started to wilt but I think they can be rescued. This morning I spent some time thinning and repotting some of my snapdragons and verbena bonariensis seedlings. It is a difficult thing to do, after raising seedlings from “birth”. The temptation for me is to keep them all out of a misguided motherly attachment, and also my greed in wanting as many plants as possible. But I have learned from experience to be ruthless in my thinning! It is better to have strong plants, but a few less of them, than to have more plants but have them all be weak from having grown too close together. If it is a seedling I really want to have more of, then I will separate and repot two that are growing in the same cell, but if I already have enough of a particular plant (remember, I still must spend the time hardening them off and then transplanting them all outside - more plants is not necessarily better!) then I just snip the extras off at the base with a pair of small scissors and be done with it. Much less work! When can I start planting vegetable seeds in Calgary? There are lots of easy to grow vegetables for Calgary zone 3. Someday when I am done the major projects in the rest of the yard, and when those raised beds are done, I will grow more vegetables myself, but for now I choose the easy route. I only start tomatoes inside because they need a head start, and the rest of my veggies are ones that are easy to grow by sowing them directly in the ground when it's warm enough. I also only grow veggies that are really worth the space, which is at a premium in my shady yard: carrots, peas, beans, lettuce, spinach all taste infinitely better picked fresh that those tasteless facsimiles at the grocery store. I also grew pumpkins last year but decided they take up too much space. Here is a schedule for planting these as well as many other vegetables with times for seeding indoors, transplanting outside, and seeding directly outside. I copied it with some modifications from The Calgary Gardener, a must-have book by the Calgary Horticultural Society. None of the plume poppy seeds I started indoors at the beginning of March have germinated, so I decided to try again, taking the easy route this time. Winter sowing is a method you can use for seeds of perennials and frost-tolerant annuals. It is especially handy for seeds that require some frost cycles to break their hard seed shells. Any seeds whose planting instructions say they can be direct sown in late fall or early spring are good candidates for winter sowing. Anything that requires warm soil temperatures to germinate is not a good candidate. This is the first time I've actually tried it, but it seems like a piece of cake, and very low maintenance, which is important now that it seems I am starting more and more seeds each year. So you just cut a milk jug (or other plastic container) in half, poke a few holes in the bottom for drainage, put 3-4 inches of soil in and water, drop in your seeds, and duct tape the top back on. Leave the lid off for ventilation. Voila! You've just made a little mini-greenhouse for your seeds to grow in! Put it outside in a sheltered spot and let nature do its work. People who've used this method before say that plants they have wintersown will bloom only slightly later than plants that were started indoors, but much earlier than ones that were sown directly into the garden. late March seed-starting report - tomato seeds are planted! I started my tomatoes this morning. This is a good time to start them if you don't have a greenhouse. Last year, as an experiment, I started them waaay too early at the end of February. They did fine, but there was a month or so when they were too big to fit under lights, so I had them in the south-facing sunroom on cool days, and hauled them outside each day it was warm enough to get more light (sunlight even through a south-facing window is not generally enough light to keep sun-loving plants from getting "leggy" - getting too tall and thin because they're stretching up trying to find more sunshine). Anyway, it was a pain in the &^$%*, let me tell ya! Plus, this year I have a 15-month-old so there is no way I can put plants in the sunroom and keep them safe. Tomatoes in late March. From now on. thyme, verbena bonariensis, salvia, and cardoon. I chatted with my friend Maggie this week-end and found out she has been reading my blog religiously for the last year, but has never once commented or let me know she was out there! She's a lurker! She said she read that I started some seeds so she immediately started her own - faster growing annuals like petunias and marigolds. Oops. Sorry Maggie. Maybe I should have been more specific. I have started some perennials and slower-growing annuals so far, but fast-growing annuals shouldn't be started until early April unless you have a greenhouse. They will get too big and leggy kept under lights or beside even the sunniest window in the house. So anyone out there, don't start any more seeds until you check with me! Or the Calgary Gardener book has an excellent chart with recommended seed-starting times. Or most seed packets will say the number of weeks before the last frost date to start that particular type. In Calgary, our last frost date is May 24 so count backwards from then. PS I also started a couple types of snapdragons from seed this week-end (February would have been better but oh well). Finally! It is time to start seeds! I haven't exactly got to everything I wanted to get done around the house, but so be it. As of March 1, gardening takes precedence. I tried. I'm trying. I'm really trying to restrict myself to only buying things this year that I really "need", and that I have space for, and that are fun for the kids. So far I have placed one bare root perennial order, and two seed orders (below). One more seed order for more veggie seeds should round it out. Why order seeds when I could just get them from the garden centre in the spring? Two reasons - better selection and even more important, it makes me feel like I'm gardening in January. I've never ordered from them before but they carry both teasel and plume poppy seeds, two things I was wanting to try this year but are hard to find. teasel (dipsacus fullonum) this plant features in the "Little Grey Rabbit" stories that my kids love so much. Squirrel uses the flowers to brush her tail. I must have some! plume poppy (macleaya cordata) this is one plant I've always considered trying, and after Steve Silk's post about it, I could resist any longer. I don't expect the plant to grow to Steve's tropical proportions in my zone 3 garden, but I still expect it to impress. I've always ordered a few things from this Manitoba nursery that sells very prairie hardy plants and seeds. In particular, I've had excellent luck with their short-season tomatoes. They also have a great "toonie" shipping charge which is a deal compared to many other mail-order companies. cynara cardoon: because it's such a big, bold plant I thought it would be fun for the kids. 'ribbon' series pink,yellow & white snapdragons (45 cm tall): I'm growing snapdragons from seed for the first time this year - I want them everywhere because they are great cutflowers plus so frost tolerant. Bonus: this variety won't require staking. help! the annuals are taking over!! This was a brand new area of the garden this spring and it looked fairly bare. Because perennials take a few years to get going, I started some annuals from seed to fill in the gaps. I don't really know what I was thinking though, because all the annuals I planted are giants by the end of the season! Here are lavatera, castor bean, cleome and nicotiana taking over the garden. They look great but I can barely see my new perennials. I'm almost tempted to cut these annuals down just so I can get a better look at the permanent perennial composition. I already pulled out the floppy clarkia and added some 'Husker's Red' penstemon instead (not in this pic). Hmm, what to do, what to do... Maybe we'll get an early frost and this will all be moot. Wait, did I just wish for frost? It must be getting close to the end of summer and I am getting tired! Here's an annual I started from seed to fill up some new spots in the garden, and fill them up it does! This one is huge (150 cm tall?) and I chose it for its beautiful fragrance. It is in full sun. This is the second year for verbena bonariensis in my garden - a butterfly magnet! I've seen it in the perennial section of certain garden centres for big $$ but it doesn't overwinter here. I started mine from seed, and bought new seed this year because I didn't want to risk not having it again. But, my plant from last year self-seeded all over the place and now I have verbena bonariensis growing up between my patio stones! Not hard to remove, though. The self-seeded ones are blooming only a week or two behind the ones I started inside this spring, so hooray! Looks like verbena bonariensis is here to stay. Pretty, but I don't think I'll bother again. I'm fine with perennials that need staking because I keep telling myself that some year I'll actually get around to staking them in time. Annuals? They must be extremely low maintenance to get a spot in my garden. No flopping allowed. spec's: 60 cm tall, full sun or light shade, drought tolerant, requires staking. I don't usually plant many annuals (too much work) but I started some cleome from seed this year to fill in some spaces as my new hill garden matures. I am loving cleome! It is easy to grow and the white just sparkles in the garden. The white ones have bloomed already and the white/pink mix ones are still in bud. spec's: full sun, 1 m tall, 30 cm wide. Borage is an annual herb that mysteriously appeared in my back garden a few years ago. I let it stay because I am a sucker for blue and anything that self-seeds but isn't invasive. I especially like how the hairy flowers and stems look when they are backlit in the evening - so pretty!! Plus the bees loves it. The flowers open pink and turn to blue, which is also cool. Apparently it can be added to salads and tastes like cucumber, but I've never tried it. Anyone recommend this? spec's: gets 60 cm tall and wide, likes full sun, self-seeds, is drought tolerant. This is an annual that self-seeds in my garden, and I always start a few from seed as well, just to make sure I have them every year. The bracts turn pink, white or purple on this plant and are very colourful and interesting. There are few annuals I grow in my garden but I like this one because it is pretty much zero maintenance. spec's: 30 cm tall, full sun, drought tolerant, self seeds. Time to thin the veggie seedlings - I'm a little behind because I had to prepare a new site for the veggie patch before I planted this year. Normally the first harvest would be much earlier. I always sow my seeds randomly within a square area, rather than neat little rows. I like the patchwork look and it is a better use of space. Thinning the plants is a pleasure since I get to make gourmet salads of the little baby plants - in this case several colours of lettuce and baby spinach. Yum! As soon as it is nice (above 10 degrees), you can start putting your seedlings or greenhouse purchases outside. The plants are very tender, or "soft", from being grown in an indoor environment. If you started your own seedling, they may also be getting a little leggy (stretched) from not enough light. But you can't just put them outside in full sun right away - well you can, but they won't like it! They will burn - just like me (fortunately, I remembered to put sunscreen on yesterday!). So set them outside in a sheltered location (shade and shelter from too much wind). Start with 30 minutes in shade, increasing to a couple hours over several days. Then start putting them in sun for 10-15 minutes each day, increasing by 15 minutes per day, then back in the shade. The sun and breeze will harden them up. If you have perennials, they will be ready to go outside in a week or so. The traditional date for planting annuals outside is May 24, but you can plant them earlier if you're willing to cover them up or move pots inside anytime there's risk of frost. Sounds like a lot of work, I know. But it's only for a week or two and your plants will thank you by not going into shock.